When fresh blueberries are abundant and reasonably priced, I pick up a bunch. Blueberries are a great source of fiber and antioxidants. When buying look for plump firm berries covered with the dusty silvery bloom that indicates a sign of freshness. 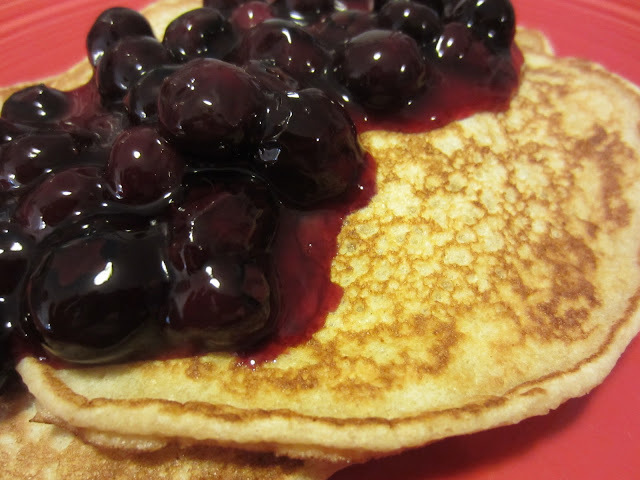 What we don't eat I freeze for future use...but what a better way to transform fresh berries and fancy up your pancakes, waffles, oatmeal, Greek yogurt, or dare I say, frozen yogurt or a slice of angel food cake than with a simple and quick blueberry sauce? The sauce is only 1p+ per 1/4cup serving and makes just about anything you put it on special. It would be fantastic on these Luscious Lemon Ricotta Pancakes or The BEST Protein Pancakes. In small saucepan, mix the berries with sugar. Combine the water, lemon juice and cornstarch until the cornstarch is dissolved in a small bowl or glass measuring cup. Pour onto the blueberries and sugar mixture. 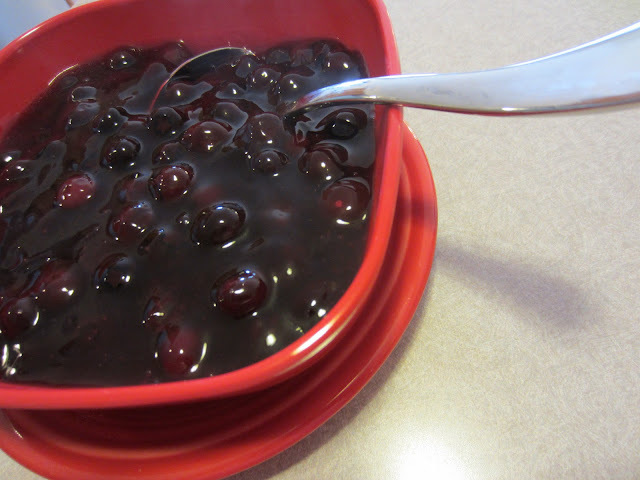 Heat over medium heat until the blueberries soften and the sauce becomes bubbly and thick. Allow to cool for a few minutes before serving. Leftovers can be refrigerated. Yum! I do this with blackberries for our waffles/pancakes and it really does make them taste extra special/good. I'll have to try it with blackberries...yum! Lovely! I just love a fruit sauce over pancakes. I usually use frozen mixed berries, though, the fresh ones don't usually survive the ride home from the store-lol! Ooh, I am so glad I have time to visit my favorite blogs today so I could vote for your soup - just voted! Yep, definitely making your blueberry sauce - they had blueberries on sale for .99 cents and I bought two last week.